Arlington, VA – Today, Child Care Aware® of America announces the selection of ten sites across the country that will join a national network of communities, states, and organizations activating Vroom, an initiative of the Bezos Family Foundation that is helping parents across the country promote brain development in children birth to five years old. Participating sites – part of Child Care Aware® of America’s nationwide Child Care Resource and Referral (CCR&R) network – will use Vroom to bolster their work with families in innovative ways, reaching hundreds of thousands of parents with brain building messages and nurturing parent-child interaction with new tools. Introduction and integration of Vroom will vary by site. 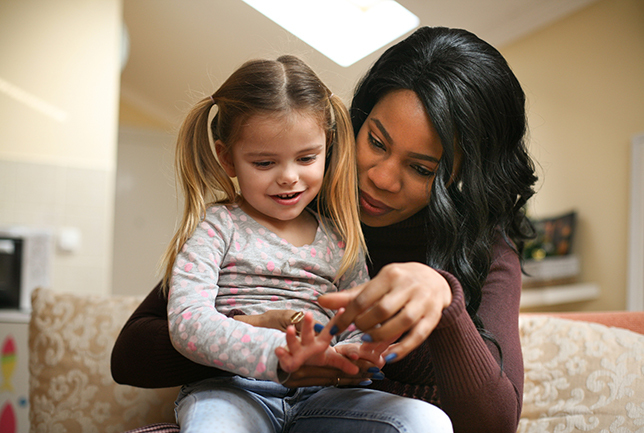 In Florida, the Department of Early Learning will use Vroom as part of its one-on-one home visitor training with providers, parents, and children. In California, the Child Care Resource Center will disseminate Vroom through its partnership network including home visiting services, community events, and in libraries. In Appalachian Ohio, the Corporation for Ohio Appalachian Development will activate Vroom across 15,000 square miles through targeted, individualized communications. In Missoula, Montana, which includes the Salish Kootenai Reservation, Child Care Resources (CCR) will provide training and sessions on early brain science to its network. Vroom provides interactive tools and resources that highlight the science behind early brain development, showing parents how they can turn activities like bath time and meal time into opportunities that build their children’s brains. This partnership is particularly exciting in its ability to facilitate a far-reaching culture shift—one that begins with parents understanding early brain development and extends into how families, providers, businesses, and communities all work to support brain development during the first five years of life. The Bezos Family Foundation is a private, independent foundation established by Jackie and Mike Bezos, who along with their children and spouses, serve as directors. Their vision is that all young people are prepared to achieve their full potential and make a meaningful contribution to society. The Bezos Family Foundation supports rigorous, inspired learning environments for young people, from birth though high school, to put their education into action. Through investments in research, public awareness, and programs, the foundation works to elevate the field of education and improve life outcomes for all children. Follow Vroom on Twitter @joinvroom and on Facebook at facebook.com/joinvroom.